We can't believe there are only two weeks of camp left! As Summer '17 draws to a close, we'd like to share with you a snapshot of the literally thousands of life-changing experiences iD Tech has delivered this year. "My daughter has really flourished in this program. Her love for computer science has really grown under the tutelage of the staff." "iD Tech continues to be an amazingly well-run summer experience. We are so pleased that my child had the opportunity to attend again. The game he created is amazing; I am a professional software engineer and I understand the work that must have gone into such a well-designed game. Truly a testament to the level of instruction he has received." "The instructors really care about the kids and take the time to make sure they're engaged and learning. They encourage them to problem-solve and help each other, but [the instructors] also provide help when needed. This is my son's second year and he already can't wait to come back." 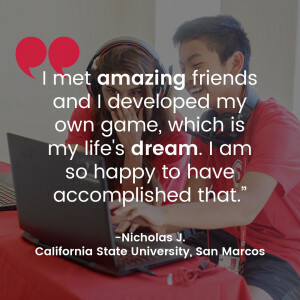 "My son had his first experience with coding in this camp, and his interest in computers took a positive turn from simply gaming to using his mind to develop and create." "Staff prioritized communication and clear concern for the campers and their well-being." "My son didn't think he would like spending part of his summer at a coding camp. He was mistaken. He absolutely loved it! His instructor was such a great mentor for him; I'm sure his instructor's passion for the field and desire to share really left a lasting impression on my son. Thank you!" "We love how every year we come back, the instructors remember my son, even instructors he had two years ago! The community feels so tight knit and we love that." "The instructor made us feel like we were a joy in his day and it was his joy to work with us and answer our questions. We found iD Tech to be top-notch, and the staff was both friendly and extremely helpful. Simply stated, they're the best." "iD Tech is the best tech camp ever! 11/10 experience!" "Camp was so amazing. From incredible instructors, to daily inspirational stories and quotes, this all-girls camp is perfect for the modern generation and manages to create a high-tech camp that also gets plenty of sunshine. End of the week prizes, special trips, and annually changing shirt designs add spice to the well-planned adventure of Alexa Café. As a longtime returner, I can say Alexa Café is well worth the money." "I love iD Tech Camps! I have made friendships that I hope will last a lifetime! The staff and faculty are welcoming and friendly, I honestly think that iD Tech is my second home, and I wish that I never have to leave!" "IT'S AMAZING, I LOVE IT! I can't wait for next year, and the year after that, and the year after that, and, well, you get the point." "I was really inspired to create a difficult game by my instructor, who told me to follow my dreams no matter how hard or far away they seem. My instructor helped give me the courage to keep coding and he made coding fun! I also formed extraordinary and close bonds with my peers that will last a lifetime!" "This has been one of the most educational 3D modeling and animation classes I have ever taken. The instructor was a genius with Maya. I wouldn't give up this experience for the world." "I never really saw myself as someone who would be able to do things like coding and programming, but this camp taught me a lot. I would definitely come back and recommend it to others!" "This camp does an excellent job at engaging the campers and allowing everyone to have a chance to learn. Throughout my week at iD Tech, I was able to experience things that I would not be able to experience anywhere else. Everyone has high spirits, intelligent minds, and this camp has an exceptional staff." Didn't get a chance to experience the iD Tech magic this summer? You can try to snag one last spot next week at a location near you! Be sure to follow our story, share your experiences at camp, and read more iD Tech Camps reviews on our Facebook, Instagram, and Twitter pages! 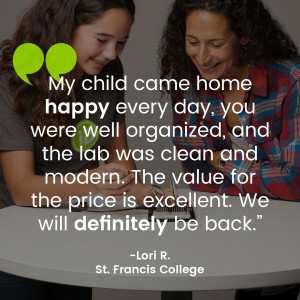 We love hearing what’s next for our students and their families!